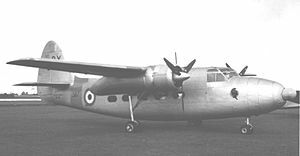 The Percival Prince was a British light transport of the early post-war period. It was a twin-engine, high-wing, cantilever monoplane of all-metal stressed-skin construction; the undercarriage was of retractable, tricycle type. The design of the Prince followed on from the solitary Merganser. Further development of the type led to the Survey Prince survey aircraft and the Sea Prince. An improved version of the Prince 3 with an increased wingspan and engine and undercarriage modifications was developed for the Royal Air Force as the Percival Pembroke. The Prince was produced in six marks for the civil market. P.50 Prince 1 - prototype based on Merganser with modified fin and undercarriage and two 520 hp Alvis Leonides 501/4 engine, one built. P.50 Prince 2 - As Prince 1 with sloping windscreen, stronger mainspar, 5 built. P.50 Prince 3 - As Prince 2 with Alvis Leonides 502/4 engine and lengthened nose on some aircraft, 12 built. P.50 Prince 4 - Conversions to Alvis Leonides 503 engines, 10 converted. P.50 Prince 5 - original designation of the Percival President. P.50 Prince 6 - Conversions to Alvis Leonides 504 engines. P.54 Survey Prince - Prince 2 with lengthened transparent nose and camera hatches, 6 built. P.57 Sea Prince C1 - Prince 2 for Royal Navy use, 3 built. P.57 Sea Prince T1 - Prince 3 with long nose housing radar, twin wheeled main undercarriage and lengthened engine nacelles for navigation and anti-submarine training, 41 built. P.57 Sea Prince C2 - Transport version of Sea Prince T1, 4 built. Royal Australian Air Force - Three Princes were in service with the RAAF from 1952 to 1957. The aircraft were used for communications and support duties at the Weapons Research Establishment, Woomera, South Australia. Thai Air Force - One Survey Prince aircraft. Thai Army - One Survey Prince aircraft. Jackson, A.J. British Civil Aircraft 1919-1972: Volume III. London:Putnam, 1988. ISBN 0 85177 818 6. Thetford, Owen, British Naval Aircraft since 1912. London:Putnam, 1978. ISBN 0 370 30021 1.